is located to the back of the site. It was originally called St Francis Cemetery and was established in 1883. With the building of the third church, it became known as the St Aloysius Cemetery. repairs were made to the cemetery. 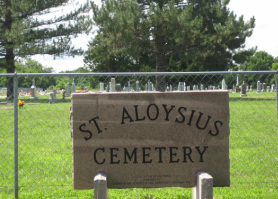 This memorial sign (left) commemorates the people buried in the cemetery in unmarked graves according to St Aloysius (Hickory) Parish records beginning in 1883. 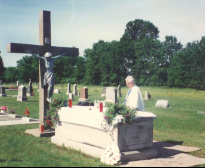 Father Donald Thissen (right) celebrates Memorial Day mass in the cemetery. Patrick Hallisey (1784-1881) is the oldest settler buried at Greenbush and the oldest known person buried in Crawford County. Another stone inscribed in French, marks the resting place of Mariane Lafouge (1800-1875), the mother of Xavier Lafouge, builder of the 1881 stone church at Greenbush. Xavier Lafouge (1823-1909) came to Kansas from France at the close of the Civil War and was responsible for the building many of the area's stone structures, including his own home which still stands just east of Greenbush. The Lafouge home was the residence of Father Verdan for two years while a stone parish house was being constructed.